During Foundations, my favorite pose was Ujjayi Pranayama while lying in Shavasana. The way it was taught completely changed my experience of Ujjayi. It resonated deeper in my body and consciousness in a way I had never noticed before. One evening, we paired up and listened to the sound of our partner practicing Ujjayi breathing WITHOUT JOINING THEM — a challenge for me! As I listened to my partner breathing, I felt a unique connection to him. It was a knowing without knowing. I didn’t know anything about the details of his life. Yet listening to his Ujjayi breath, I had an embodied awareness of him. Sharing my own Ujjayi breath, I felt as if I was giving him a gift beyond anything material that I could ever give. Just as my own experience was profound, so were others. To share their experiences, fellow students used beautiful words: connection, love, peace, a sense of no longer being alone or having to be afraid. I am so grateful for Foundations and how all of the Svaroopa® yoga poses lead me deeper into myself. They give me the awareness of the ever-present connection, love and peace. Yet Ujjayi Pranayama has been the foundation of my practices since I learned it in my first Svaroopa® yoga class. On days when I don’t do a full yoga practice, I still do Ujjayi Pranayama, because I have an embodied knowledge of its effect. It keeps my head above water in the whirl and swirl of life. Deepest gratitude to Swamiji, my Foundations Trainers (Bhakta and Kamala), and to all of my fellow yogis in Foundations. This entry was posted in Ashram News on November 30, 2017 by Svaroopa Vidya Ashram. I began with being thankful to find practices that transformed my achy body and my crazy mind. I was thankful enough to begin doing seva and making donations to the Ashram. But it took me a while to figure out that mere thankfulness is not real gratitude. Gratitude is more. Gratitude is about feeling thankful down to your bones, down into your heart. Gratitude is about getting out of your own way — your ego — and letting down your guard. Gratitude is humbling and awe-inspiring. At first, I didn’t understand the depth of my feeling. I do not easily let down my guard. But, gradually, the walls have been coming down. Now I am able, more and more often, to feel into the depth of my devotion. It’s because the power of my yogic practices is eroding years, maybe lifetimes, of “guck” around my heart. And I owe it all to my Guru. One of my favorite songs captures the way I feel. It asks, “Have I told you lately that I love you, that there is no one else above you?” It describes the effect of this love: it can “fill my heart with gladness, take away my sadness, ease my troubles.” The song goes on to say that this love is “less defined; it’s yours and it’s mine.” And, at the end of the day, we “should give thanks to the One.” Yes, this is how I feel. I indulge in this gratitude and mystical play every day when I meditate. Before I begin, I express my gratitude to the One who reminds me who I am. In meditation, I feel the separation between my individuality and my Guru’s individuality begin to blur. It truly does feel as if there is only One, even if I can’t always maintain that feeling throughout the day. In this glorious season of thankfulness and giving, I encourage you to let down your guard. Open up to the gifts your yogic practices give you. Open your heart to the “more” that you are. I hope you will also give thanks to the One. And if this takes the form of a heartfelt donation to the yogic organization that makes this possible for you, I would be eternally grateful. Please click here to donate, or call 610.644.7555. Every gift, of any size and frequency, makes a difference. This entry was posted in Ashram News on November 28, 2017 by Svaroopa Vidya Ashram. “Time and Timeless” illustrates my experience of timelessness. One sentence from our November teachings article says it all: “Though you can’t add more hours to the clock, yoga offers tools to free you from the tyranny of time.” Doing only 20 minutes of Ujjayi Pranayama daily will help you make friends with time; that with this practice, things begin to dovetail and flow… time then is no longer your enemy. Swami Nirmalananda and Vidyadevi promise that Ujjayi Pranayama makes you the master of time. Wow! How amazing and how transformative. How ironic that “stopping” to practice Ujjayi Pranayama will give you more “time.” You might think if you stop to breathe for 20 minutes that you’ll lose the time to get 4 or 5 things done on your list. Or maybe you believe you’ll be in more of a frenzy to make up for lost time. However, when spending time with timelessness, you feel a shift in perception. You might even conclude that some of the things you thought were so important on your list are not. Priorities change. Life flows in surprising and delightful ways. Have you had the experience of stopping, breathing and then feeling like a different person afterwards? If so, even more breathing (and especially meditation) will help you to remain in that state, more and more. I took an “Introduction to Meditation” weekend with Vidyadevi. When she asked about our meditation experiences, I shared that time had slowed way down. I felt like I had all the time in the world. She said, “Yes, there is timelessness in meditation.” I had felt I was just being, in beingness; alive in beingness. Experiencing this infinite reality within myself, I became conscious of the “more” within me. Instead of feeling empty and lacking, I felt full and sufficient. The timelessness in meditation feels like going to the cosmic time tank. Make friends with time. Our Svaroopa® yoga practices excel at giving you the experience of beingness. This experience offers you so much. It’s yours for the taking. Do more Ujjayi Pranayama. This entry was posted in Ashram News on November 24, 2017 by Svaroopa Vidya Ashram. When I happened onto this path, I already thought I was a yogi. But it was all in my head, though I practiced yoga poses and was a teacher in another yoga style. I felt my body only when it was in pain. My mind rarely stopped or even slowed. I am grateful, of course, for the transformative Svaroopa® yoga and meditation practices that are now dissolving tensions in my body and reining in my mind. Yet my gratitude for the guidance I’ve received from Swamiji and our Teacher Trainers is uppermost in my awareness. In Foundations, Swamiji (then Rama) served as our primary teacher. She introduced me to Consciousness, then a new concept. For the 12 years since, her teachings in programs, trainings and a wealth of online Freebies have daily guided me to the tangible, mystical experience of Self, Pure Consciousness. A decade ago, I learned to meditate in Vidyadevi’s “Meditation Made Easy” weekend. Later in YTT Level 3 with Kusuma and Vidyadevi, I heard that mantra was “scrubby bubbles” for the mind. How grateful I was to clarify a mind often cluttered with reactivity. Yet I’ve received something more, for which it is hard to find words. Whenever I’ve brought up a professional or personal issue, Swamiji and our Trainers have listened, comprehended the problem and responded effectively. Their guidance has always been based in the ancient, authentic teachings of the Svaroopa® Sciences. Thus their guidance conveys more than information, it’s an illumined perspective. I recognize that it’s infused with Grace and I am propelled by Grace to follow their guidance. This has empowered me to live effectively and harmoniously with life’s challenges as well as life’s joys. Consciousness is the foundation that supports my capacity to do the work I love. Of course ongoing Svaroopa® yoga and meditation teacher trainings give me the skills and knowledge to do so. 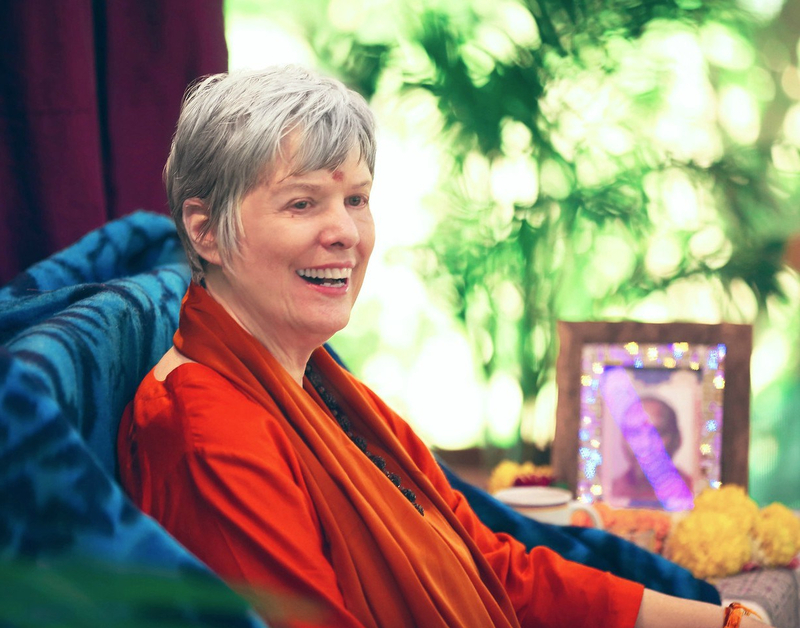 Yet the Grace-Full guidance of Swamiji and our Teacher Trainers gives me more — the palpable sense that Divine Essence is at heart of everything and everyone, myself included. Then I know experientially that I am, as everyone is, the One Self Being All. Such guidance has given me a life worth living. That’s why I delight in donating monthly as well as giving a special gift twice yearly. Giving is such a sweet celebration! Gratitude & Grace are present in my daily life, thanks to Swami Nirmalananda, our Svaroopa® Vidya Ashram, our Teacher Trainers, our Svaroopa® Sciences practices — and you, my fellow Svaroopis. There is so much to be grateful for. What has this path given you? What are you grateful for? Please celebrate these extraordinary Grace-Full gifts by giving back to the source: click here to donate online or call the Ashram at 610.644.7555. Every gift, of any size and frequency, makes a difference. Thank you. This entry was posted in Ashram News, Fundraiser on November 22, 2017 by Svaroopa Vidya Ashram. For me, the easiest way to gratitude, grace, generosity and abundance is through surrender, specifically surrender to the flow of Grace, which is also the Guru and the Self. Grace is powerfully present within the Svaroopa® Sciences. Such a yogic surrender naturally leads to an immense, overflowing gratitude. When you act on that gratitude, your action comes from authentic generosity, which leads to abundance. The Goddess MahaLakshmi is the cosmic or celestial form of abundance. She is the circular flow from gratitude through generosity to abundance, and around again. Gratitude and Grace move you. They overwhelm in a wonderful way. They open your heart, not only to others, but to a deeper perspective. They make you able to see what you have, truly an ever-expanding inner abundance. And that creates generosity. Please join me and others, and participate in our Gratitude & Grace fundraiser for our Ashram. Let the spirit of gratitude move you to give generously. When you give a gift to support the Guru’s work, great blessings flow to you, both outer and inner. It’s part of the science of yoga. It is also MahaLakshmi’s promise. Click here to donate. This entry was posted in Ashram News on November 21, 2017 by Svaroopa Vidya Ashram. Swami Nirmalananda makes the profound, ancient teachings and practices of yoga so accessible and easy to understand. The way she translates them to pertain to everyday life is such a gift! So today I celebrate the anniversary of her birth. When I contemplate my journey on this path and my relationship to Swami Nirmalananda, “support” is the first word that comes up. Being in relationship with Swamiji has brought Grace-filled, Grace-fueled support to my life, on the inside and the outside. Svaroopa® yoga asana practice first gave me tangible physical support. Swamiji originated this yoga style from spontaneous Kundalini movements arising during her meditations. Her Guru, Baba Muktananda, blessed her with these openings, borne of the inner power of revelation. This Grace-filled asana practice drew me in and placed me on the path. I first learned “support equals release.” This is true on all levels. Guru’s Grace and support are built into every aspect of this yoga. The poses open so much more than just the physical body! Given that opening, I have experienced the ever-deepening support of Swamiji’s meditative teachings and devotional practices. Every practice points me back to my Self. And, of course, there’s the portable Guru, the mantra. It is always there to remind me that the Guru, who is my own Self, is so close. The greatest blessing of my Guru is the gift of Shaktipat, the awakening of the Kundalini energy. It opens me to the tangible support of my inner Guru, my inner guide. When I stepped onto this path, I was riddled with self-doubt. I was convinced that “I wasn’t doing it right.” I felt that I didn’t really know how to meditate, that I wasn’t getting it! I felt numb mentally and physically. Yet I knew I needed to be on this path. It was a deeper knowing, a knowing beyond the negativity of my mind. Something was propelling me forward, even though my mind couldn’t explain or comprehend what I was getting. Things were changing at a deeper level than I could perceive at the time. Clearly my negative and doubtful mind wasn’t on board. What kept me going all those years? Much later, I understood that I had received Guru initiation. It was a spontaneous Shaktipat. The Grace of the Gurus propelled me along the path and continues to propel me forward. Swamiji’s Grace supports me on the inside and the outside. Thus, I too can live in the ever-expanding pure joy and contentment of my own Self! So on Swamiji’s birthday, I celebrate her. I feel immensely blessed to be in relationship with a Great Being. How could I be so fortunate to have found this path? It truly is the greatest gift. Happy Birthday, Swamiji! This entry was posted in Ashram News on November 15, 2017 by Svaroopa Vidya Ashram. A decade ago, my Guru Swami Nirmalananda set me on fire. She gave me a simple adjustment in Alternate Leg pose. That touch ignited a slow burn, which has been profoundly transformative. I am truly grateful, for I am different now in ways I could never have imagined. If you had told me then that I would have compassion for people who were trying to harm me or my family, I would have told you in no uncertain terms you were wrong. Yet here I am, wanting to help those whom, in the past, I would have called enemies. Before she came into my life, I was caught in drama, in the pursuit of desire. Now I have only the one yearning, to know myself as the One Self Being All. Because I am grateful to Guruji, I feel compelled to show my gratitude. Yet how do you show gratitude to her, when she attributes everything that she gives as coming from her own Guru? When you thank her for all she has given, Guruji says she does what Baba has empowered her to do. She offers to us what Baba offered to her. She gives to us what we are able to receive. So I feel that showing gratitude is supporting her in any way I can. As a SVA Board Member, I serve by managing Ashram facilities. I help improve the Ashram buildings that hold the Shakti which she infuses. In gratitude, I offer time and service to support our community. Following Guruji’s lead, I deal with everyone I meet in a more meaningful and present way. I am empowered to do this because Guru’s Grace flows through me into everyone with whom I come into contact. At this designated time of Thanksgiving, I ask you to find a way to show your gratitude for what you have received from Swami Nirmalananda’s teachings and presence. Expressing your gratitude tangibly will serve you in cultivating the seeds of transformation that she has planted in you. Once you fully give yourself to the act of giving, things that you could never have imagined will unfold. Or perhaps looking at this another way works better for you. A better question may be how much can you receive? Perhaps you don’t yet notice what she has planted in you. If so, pondering this question will help you notice the new you that is beginning to form, thanks to Swami Nirmalananda’s teachings and presence. In any case, I invite you to recognize what you have received and find a way to show your gratitude. I don’t fully comprehend how she brings to fruition the transformation in each of us who sit at her feet. I just know that I want to help her do what she does for all of us. I ask you to do as I am doing, to support her in any way you can. In this season of giving and gratitude please give what you can to support Guruji. Click here to donate on online, or call the Ashram at 610.644.7555. Every gift, of any size and frequency, makes a difference. Thank you. This entry was posted in Ashram News, Fundraiser on November 14, 2017 by Svaroopa Vidya Ashram.